From the maker of L'il Critters -- America’s #1 Gummy Vitamin brand -- comes Jurassic World™ Complete Multivitamin. With nutrients like Vitamins A, B-6, B-12, C, D and E, parents can trust that their kids are getting the essential vitamins and minerals they need to support healthy growth and development. * Plus, Jurassic World™ gummies come in delicious, naturally sourced Strawberry, Orange and Pineapple flavors in fun dinosaur shapes. 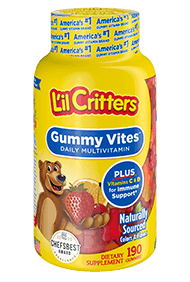 Best of all, L’il Critters™ vitamins give you the nutrients you need without anything extra -- because what’s in our gummies is as important as what’s not! Jurassic World is a trademark and copyright of Universal Studios and Amblin Entertainment, Inc.. All Rights Reserved.